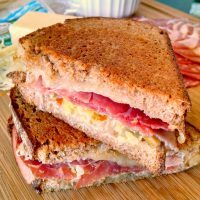 With all the flavors of a traditional Muffaletta sandwich, this Muffaletta Grilled Cheese using Rumiano Cheese is a delicious and family friendly version of the New Orleans tradition ‘wich. It’s #GrilledCheeseMonth! Didn’t ya know it? I missed grilled cheese day. That was Sunday. We had a jam packed weekend which included having Dad and R over for dinner Saturday night. We had a great time! Which is to be expected because we always have a great time with them. We served up some bacon wrapped scallops for an appetizer, steak with a twice baked cauliflower mash for dinner, and peanut butter parfait for dessert. They’re doing the low carb thing so I was trying to be respectful of that. This grilled cheese isn’t low carb, though. It’s delicious, but not low carb. Rumiano Cheese gave me coupons for free cheese this month. This is the second cheese I obtained with one of those coupons; mozzarella. Who doesn’t love a good mozzarella? And, of course it being an Italian cheese, I almost immediately went to an Italian meats sandwich. Well, I sort of did. But I was looking more for a pressed sandwich. Then I stumbled on a Muffaletta and that’s when I knew! 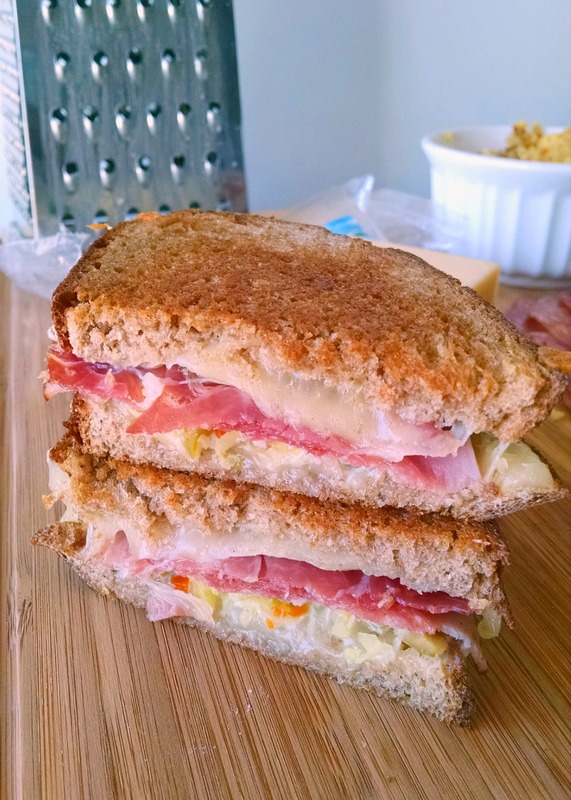 I’m making a Muffaletta Grilled Cheese! Okay, I’ve never actually HAD an authentic Muffaletta sandwich. It’s on my to do list. Trust me. But, I did some research, and the jury is out as to the authentic meats and cheese that go into this world famous sandwich. Since it was pretty much up for grabs, I headed to the store and purchased some delicious Italian meats; pepper salami, callabrese salami, and capicolla ham. I also purchased some black forest ham, too. Because Italian meats just weren’t enough. Since I had some giardinera left over from the Muffaletta Pasta Salad I made a few months back, I put some of those vegetables in the mini food processor we have along with some green olives. Voila! Giardinera spread is made! 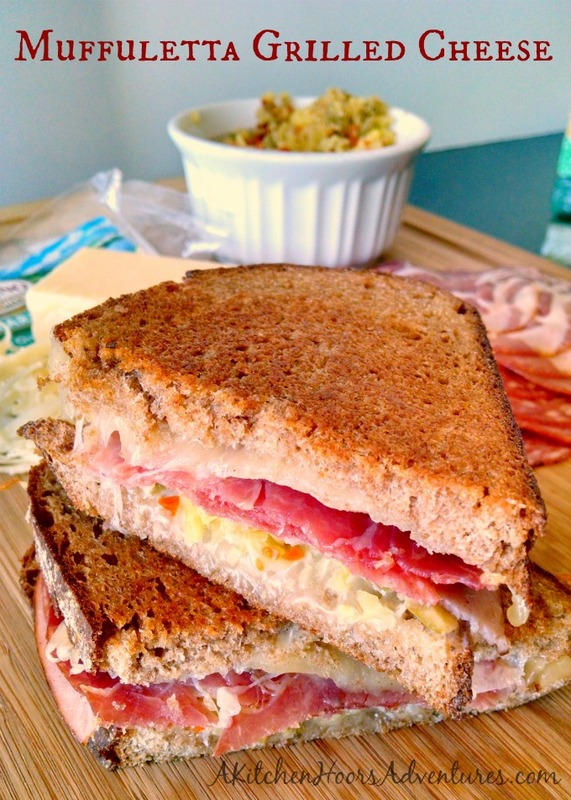 You have to have an olive spread on a Muffaletta sandwich. It makes the whole sandwich. It’s just not the same if you omit it. So, do yourself a favor and make the spread. This time, instead of slicing the Rumiano Cheese cheese I decided to shred it. There are so many ways to make a grilled cheese sandwich that I thought shredding the cheese on this one would be different than what I’m used to. Yes, I’m a slicer not a shredder. But, it’s always good to change it up a bit and step outside your comfort zone. And that’s what I did with the shredded mozzarella Rumiano Cheese and not slicing it. I wondered if it would be any different in the melt time and consistency if I shredded it as opposed to slicing it. Not really. It’s about the same either way depending on the thickness of your slices. I’m surprised at how tolerant S has been with my grilled cheese escapades using Rumiano Cheese. I think I have one more in me before I call it quits for the month. It may or may not involve some Cuban pork or maybe some Tex-Mex chicken. Just have to see how things go this weekend, but you could pretty much put whatever you want on a grilled cheese. But honestly, this Muffaletta grilled cheese with Rumiano Cheese is delicious. It has tasty Italian meats and salamis, some delicious ham, and tasty giardinera olive spread. I initially thought the olive spread was going to be too salty. Or too vinegar-y, but it really wasn’t. The spread adds a nice salty, spicy, vinegar-y accessory. It’s like mustard but not really like mustard. Mustard is vinegar-y, spicy, and tasty and the giardinera spread is vinegar-y, spicy, and tasty. The difference it, this giardinera spread is chunky and adds a crunch to the sandwich that mustard truly wouldn’t add to any sandwich. So, not only does it add a level of flavor, but it adds a level of texture that you don’t expect in a grilled cheese. So, are you a slicer or a shredder? What’s your favorite toppings on a grilled cheese? 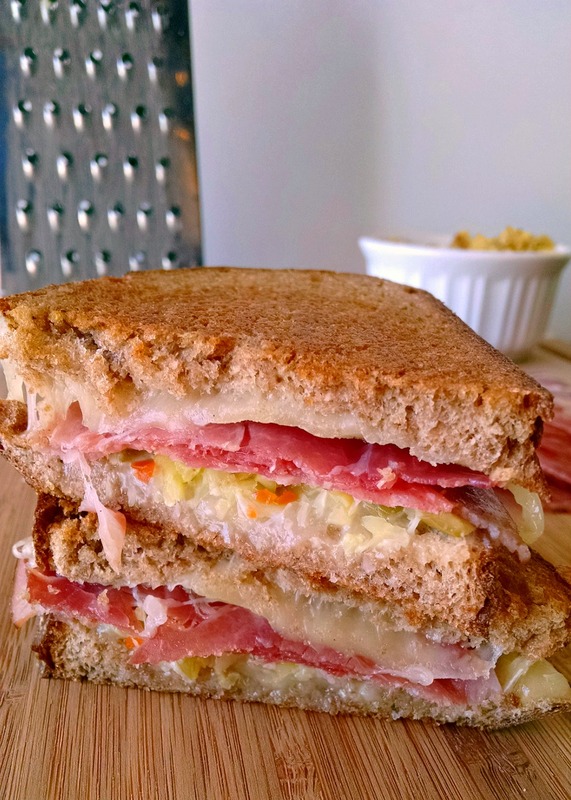 With all the flavors of a traditional Muffaletta sandwich, this Muffaletta Grilled Cheese using Rumiano Cheese is a delicious and family friendly version of the New Orleans tradition 'wich. Place one ounce of cheese on one slice of bread. Top with one quarter of the ham, salami, capicola, and calabrese. Spread a thin layer of the olive spread on top of the meat and top with one ounce of cheese. Top with one quarter of the ham, salami, capicola, calabrese, and another once of cheese. Assemble the second sandwich in the same manner. Heat a medium skillet coated with cooking spray over medium heat. Carefully separate the two buttered pieces of bread and place the one topped with the filling in the skillet. Place the second piece of bread butter side up on top. Using a spatula, carefully press the sandwich down; allowing all the meats and cheese to get comfy. Cook 5 to 6 minutes or until golden brown and the cheese begins to melt. Carefully flip the sandwich over, cover, and cook 5 to 6 minutes or until golden brown and the cheese is completely melted. Remove from heat and allow to cool 1 to 2 minutes before slicing. Repeat last two steps with second sandwich. 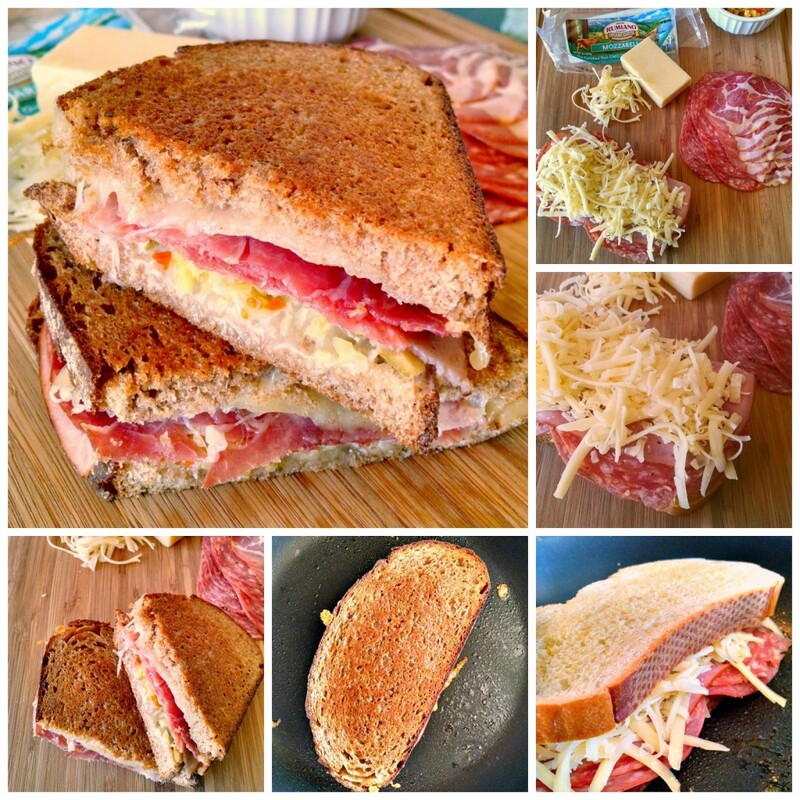 Slice both sandwiches and serve with some spicy fries or chips.